I am a poet. But any subject is fair game here. For some time, I’ve been meaning to say something about Me and the Dead, debut collection from Katy Evans-Bush, a.k.a. Ms Baroque from the blog, Baroque in Hackney. This isn’t a review in the normal sense. I know Katy. I’ve even slept on the Baroque Mansion sofa after a memorable evening in London earlier this year. But it’s a very good book, so I thought I’d say something about it. In the title poem, death is “an assemblage of fragments” with a sting in the tail, as life at times can feel like an assemblage of death-fragments. The poems in this collection have such variety in form and subject-matter that the collection might at first appear similarly fragmented, but it’s held together by clever sequencing and an eloquent, definable tone. in the peach glow as she looked out at me. lurched, and out popped my particular poison. She looked away and I went on, awake. like the sound of the universe. We’ve never been closer. is nothing and space for everything. What the poem says is clear, but not simplistic; the words and syntax are ordinary but not prosaic. It’s like an invitation to any casual reader, and says, “Read this. Read it again.” That’s what I’d recommend of the whole book. Close Reading of J.R.Q. MacPrune's 'Now'. 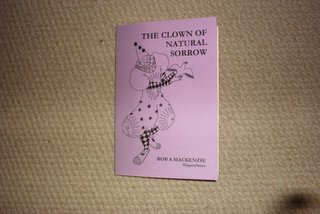 The Clown of Natural Sorrow has completely sold out. What Kind of Reviews Do We Need?